The residency week in Belgium gives you the opportunity to complement your flexible online learning with an onsite learning experience that will leave you with lifetime memories. The Alfred Ford School of Management is situated on a forty-seven-acre property in the foothills of the Ardennes mountains, a tranquil setting perfect for study. 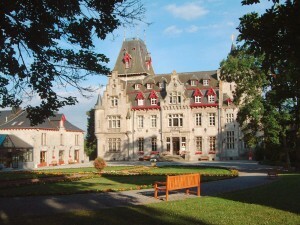 The school’s building is adjacent to the historic and picturesque Chateau de Petite Somme. The superb location of the school and its progressive teaching are not the only elements that will have an impact on your learning experience. The residential week provides students with bouts of intense teamwork exercises and networking opportunities. The high-impact sessions are filled with seminars, case studies, and team assignments. With students from every continent, it is a truly international experience and an opportunity to get to know fellow future leaders.